We met many new people on board the ship. We sat with different people all the time. But we really hit it off with two couples, Bridget & Tom and Fran & Dale. We really enjoyed their company. We had quite a bit in common. We found out Tom & Bridget were also staying five extra days in Bergen at the end of the cruise. We got together at for dinner in Bergen a couple times and spent a day touring the Hardanger Fjord together. Hopefully, these are new friends we will see again. 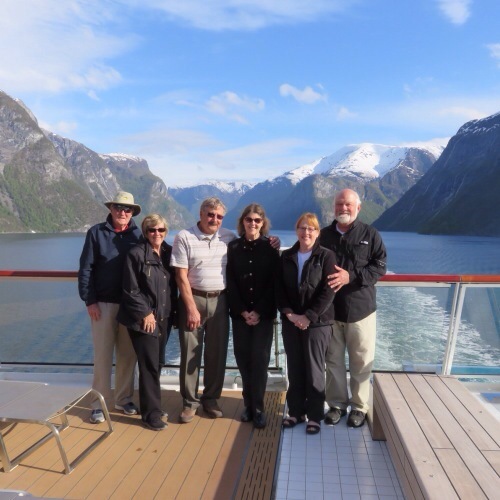 Dale, Fran, Tom, Bridget, me and Mike on the ship going through the Sognefjord. When we entered the fjord in the morning it was windy, overcast and drizzling. When we left that evening to go back through the fjord, it was beautiful weather, chilly but sunny and clear. It was an amazing view.